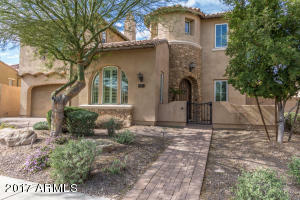 Outstanding estate style home in the community of sonoran mountain ranch. Private gated courtyard entry with exterior fireplace and paver patio. Exquisite finishes, granite, flooring, and details throughout. Soothing palette, upgraded lighting/ceiling fans, beautiful tile floor, plantation shutters, high end carpet, and dramatic rounded foyer. Stunning gourmet kitchen features center island, granite counters, glass tiled backsplash, ss appliances, built-in desk area, and plethora of upgraded wood cabinetry with stylish hardware. Perfect home for entertaining inside and out. Enjoy the sparkling pool, spa, extended covered flagstone patio, colorful flora, and endless blue skies. Do not miss this opportunity to own ''perfection'' at its finest! Directions: Start From n pyramid peak pkwy & n sonoran mtn ranch rd. From there, go M pyramid peak pkwy to left onto n sonoran mtn ranch rd. Turn left onto n lighting lane. Left onto n 68th ave.